Handsome, wealthy, and a veteran of service in India, Captain Edward Ashburnham appears to be the ideal 'good soldier' and the embodiment of English upper-class virtues. But for his creator, Ford Madox Ford, he also represents the corruption at society's core. Beneath Ashburnham's charming, polished exterior lurks a soul well-versed in the arts of deception, hypocrisy, and betrayal. Throughout the nine years of his friendship with an equally privileged American, John Dowell, Ashburnham has been having an affair with Dowell's wife, Florence. Unlike Dowell, Ashburnham's own wife, Leonora, is well aware of it. When The Good Soldier was first published in 1915, its pitiless portrait of an amoral society dedicated to its own pleasure and convinced of its own superiority outraged many readers. 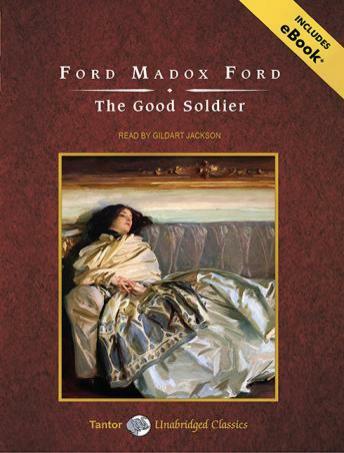 Stylistically daring, The Good Soldier is narrated, unreliably, by Dowell, through whom Ford provides a level of bitter irony. Dowell's disjointed, stumbling storytelling not only subverts linear temporality to satisfying effect, it also reflects his struggle to accept a world without honor, order, or permanence. Called the best French novel in the English language, The Good Soldier is both tragic and darkly comic, and it established Ford as an important contributor to the development of literary modernism.